The 2013 Road World Championships in Florence, Italy, comes to a close this Sunday with perhaps the most anticipated of all: the elite men’s road race. Everybody who’s anybody has won the coveted rainbow jersey granted to the winner, from Eddy Merckx and Bernard Hinault to Tom Boonen and Mark Cavendish, and this year sees a whole host of this generation’s best riders ditching their trade teams and representing their nations, with the aim of adding one of cycling’s most illustrious titles to their palmares. 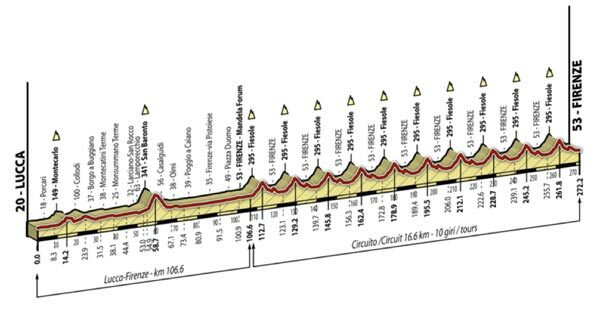 The race begins in Lucca and travels eastwards into Florence, where the riders will proceed to take on 10 laps of a circuit which is anticipated to be one of the most difficult in years. The first decisive part of the course will be the Fiesole climb, a category three effort tackled in the first half of the circuit, lasting 4.5 kilometres and with an average gradient of 5.1%, with its steepest ramps reaching 10%. Then, just a few kilometres from the circuit’s completion, the riders meet another potential launch-pad in the shape of a brief uphill that, though uncategorised, includes a ramp of 16% – the highest on the circuit. With every ascent of these climbs, the riders’ legs will be tested further, and the relentless nature of the course will make for a war of attrition. By the finishing straight – which is itself on a very slight uphill – the peloton will have covered a total of 272 kilometres, and only the very best will be in contention at this stage. The home favourite will be looking to end an exceptional season in style. Victory at the Giro d’Italia in May finally saw him triumph in his home grand tour, and now the next feat he hopes to add to his palamares – following second-place finishes at Milan-San Remo and Liege-Bastogne-Liege – is a major single-day title. The difficult course suits him, as the persistent difficult climbs provide him the opportunity of attacking alone, and thus rendering irrelevant his lack of a sprint finish. Going into the race, Cancellara is, perhaps surprisingly, the bookie’s favourite. As such a (relatively) heavy rider the toughness of the climbs would not ostensibly appear to suit him, but, such is the classy Swiss rider’s form at the Vuelta, this could yet be the year he adds a road race title to his four time trial wins. The Spanish team has the luxury/problem of a team bursting with the class of Joaquim Rodriguez, Dani Moreno, Samuel Sanchez and Alberto Contador riding for them, but team manager Javier Martinez has backed Valverde as sole leader. Despite his ability, Valverde has a habit of settling for second place rather than taking the initiative and winning; in a race where runners up are rewarded more than in any other, it is likely Valverde will further add to his collection of silver and bronze medals. The defending champions has endured a difficult season, failing to find his best form until La Vuelta a Espana, where he achieved his first win. Intriguingly, this is the exact pattern that shaped his 2012 season, when he went on to win the world championships road race. If Gilbert has again timed his form to perfection, history could yet repeat itself. Though the major favourites will all be racing against each other, they will be united in one goal; that Peter Sagan (above) must be dropped. As long as the Slovak hangs onto the front group, the riders will be fearful of his sprint finish, of which no other favourite – except perhaps Norwegian Edvald Boasson Hagen – has a hope of bettering. Without a strong team to support him, the 23-year-old will struggle to control the race, and may well have to wait another year to claim his first rainbow jersey. Colombia is enjoying a major renaissance at the moment, and line up on Sunday with the full roster of nine competitors. Unfortunately, none of them seem to be in top form at the moment; Rigoberto Uran, Sergio Henao and Carlos Betancur were all under par at the Vuelta, while Nairo Quintana lacked his Tour de France acceleration at the Tour of Britain. Nonetheless, with so many talented riders we can still expect them to ride aggressively over the climbs. The Tour de France champion has hardly excelled in one day racing to date, but he’s giving it another go at the Worlds this Sunday. His climbing style is more suited to the long climbs found in the Alps and the Pyrenees than the short, steep efforts on route here in Tuscany, but his explosiveness and time trialing ability may yet translate to this very different mode of racing. Repaying the favour of Froome’s help at the 2012 Tour de France, the recent Tour of Britain winner and time trial silver medallist will be riding in a support role. As will a host of other big names, including Geraint Thomas, Ian Stannard, and 2011 world champion Mark Cavendish. With such a strong line up, expect Britain to be one of the major forces in how this race shapes up.